One of the very reasons why I started this blog was to make travel easier for you guys, my readers. After travelling lot as well as living in London for two years, I knew first-hand that getting to know a city and finding the secret spots that only locals know is no easy task – especially if it’s your first time visiting. It can get a little daunting trying to have an authentic travel experience when all you have to guide you are biased online forums and destination guides that only scratch the surface. When the team at newly opened Holiday Inn Express Brisbane Central asked me to reveal a few of my secret spots in my hometown of Brisbane, I couldn’t say no because that’s what this blog is all about – experiencing a destination from a local’s lens . Enjoy! - I’ve always said the best way to experience a city is by foot. My tip? 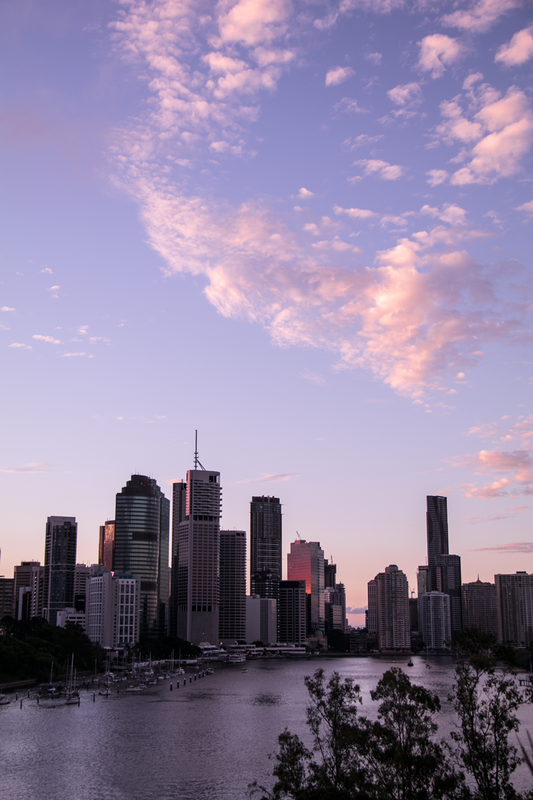 Get your most comfortable shoes on, walk everywhere and get to know Brisbane like a local. I also highly recommend doing a free walking tour with a local guide from Brisbane Greeters. There are lots of tours to choose from, depending on your interests and time available. However, if walking tours isn’t your thing, you could also do the floating Brisbane River walk from New Farm to underneath the Story Bridge for the best city views. - One of my favourite places in Brisbane to get authentic Italian is Popolo Italian Kitchen & Bar in South Bank. A local institution, don’t expect to find this spot in any guides! My tip? Order the pancetta pizza, it’s super delicious! - If road trips are your jam, and I hope they are, organise a hire car so you can drive to Toowoomba for a quick day trip. Only 90 minutes west from Holiday Inn Express Brisbane Central, T-Ba (as it’s fondly known as) has the best country food, vintage shopping and pubs on offer. And if you happen to be visiting Brisbane in spring, you’ll get to experience the world-renowned Toowoomba Carnival of Flowers. - One of my favourite spots in Brisbane is the Gallery of Modern Art, also known affectionately by locals as GOMA. Pretty much everyone who visits Brisbane will stop into GOMA however, my secret spot is actually the lush grass paddock at the front and to the side of the gallery. Here you’ll find locals lying here, snacking on a home brought picnic and enjoying uninterrupted views of Brisbane’s CBD. It’s particularly beautiful at sunset whilst watching the building lights switch on. - If there’s one thing BrisVegas locals love doing, it’s dining out because the weather is so good here all year round. If you have a sweet tooth and you’re looking for a dessert cafe that you won’t expect to find in a travel guide at your local bookstore, Chester Street Bakery in New Farm is a must. Be dazzled by all the cakes on offer and choose as many slices as your stomach will let you. My personal favourite? 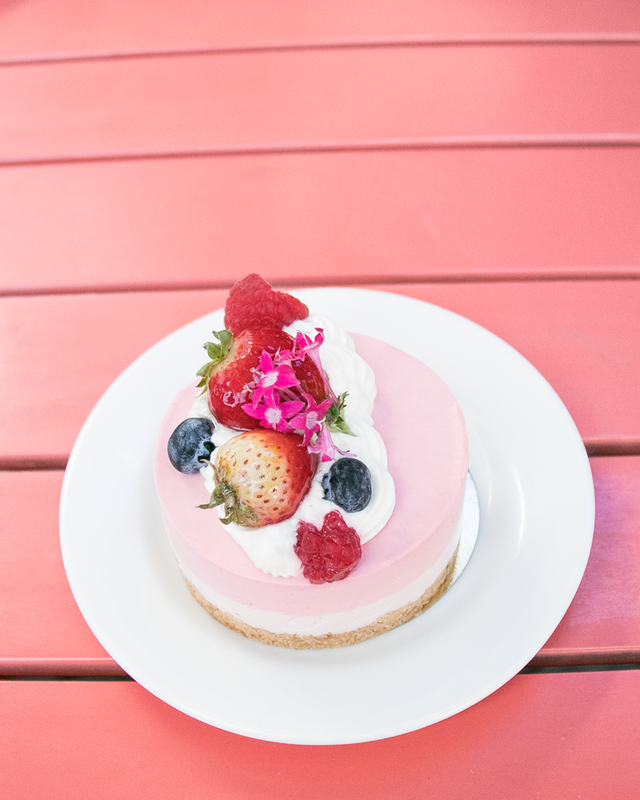 The Strawberry Cheesecake - it’s delicious. - Yes, Brisbane is well known for Mt Coot-tha, however this isn’t a locally known secret spot; the Purga National Park is. Just 50 minutes by car from the Holiday Inn Express Brisbane Central, Purga is a beautiful national park that is perfect for travellers wanting to get their nature fix. And because it’s so close to Brisbane, you could easily do this trip in half a day. - Exploring Chinatown in Fortitude Valley (only a 10-minute walk from the Holiday Inn Express Brisbane Central) is a must when you’re visiting Brisbane. But don’t worry if you get overwhelmed by the many, many, many Asian restaurants to choose from. Why? There is only one place you need to dine at and that’s The Vietnamese on Wickham Street. They have been serving up the best Vietnamese food for as long as I can remember and it’s always packed with locals from all walks of life. Prepare to spend no more than $20 for an entrée and a main – it’s so good! My tip? You don’t need to book but I suggest you get there early for dinner because it can get packed very quickly. - If you love paddock to plate style food, you must explore the Jan Powers Farmers Markets in New Farm on Saturday mornings from 6am to 12pm for the best and freshest local produce on offer. My tip? Order an Uber and get down there early before the crowds set in around 9am; the markets are only a quick 10-minute drive from the Holiday Inn Express Brisbane Central. It’s a must for Brisbane locals who start their weekend at the market before throwing down a few picnic blankets with friends to enjoy their culinary delights next door at New Farm Park. Grab a cosy spot under the many trees lining the Brisbane River, or by the carefully tended rose bushes. - After a long day of exploring, grab a sunset cocktail from Super Whatnot on Burnett Lane in the CBD, only a short 5-minute walk from the Holiday Inn Express Brisbane Central. This hole in the wall is an après work favourite amongst locals on Friday night, as well as Saturday night. My tip? Get the Coco Lopez, I happen to think it’s the best cocktail on the menu. - If you love all things earthy, the West End Markets (also known as the Davies Park Market West End) is the place to be in Brisbane for locals. On every Saturday from 6am to 2pm, the West End Markets is the perfect place to meet a few interesting locals, pick up some locally grown organic produce and stock up on lots of vintage. - The University of Queensland is Brisbane’s most beautiful and decorated university, even I went there for a couple of years! Located in St Lucia, it’s a well-known spot for a walk along the Brisbane River at sunrise. My tip? This activity is best done on weekends as it can get busy on campus during the week. - There are a lot of places along the river to enjoy the views of the CBD, especially the overly crowded South Bank. However, if you want a perfect spot known only to locals, the Kangaroo Point stairs at Kangaroo Point offers the best views. You could easily walk here from Holiday Inn Express Brisbane Central and watch the sunset over the city when you reach the top. - If street side dining in ambience is your thing, lunch at the Little Greek Taverna in West End is a must. It’s a fiercely kept locals only secret spot, dishing up the best Greek food in Brisbane, and is only a short ten-minute Uber ride from the Holiday Inn Express Brisbane Central. As soon as you sit down, order the tzatziki and pita bread whilst you peruse the rest of the menu. After your first bite, you’ll feel like you’re back in Mykonos. - With so much to see and do in Brisbane, you might not end up hearing about Dayboro. Brisbane locals flock to this small country town on weekends for a quiet country escape away from the hustle and bustle of city life. Located 45-minutes north of the Holiday Inn Express Brisbane Central by hire car, Dayboro is a secret spot amongst Brissie locals who love sifting through antique shops and filling their cars with the best vintage finds in South East Queensland.